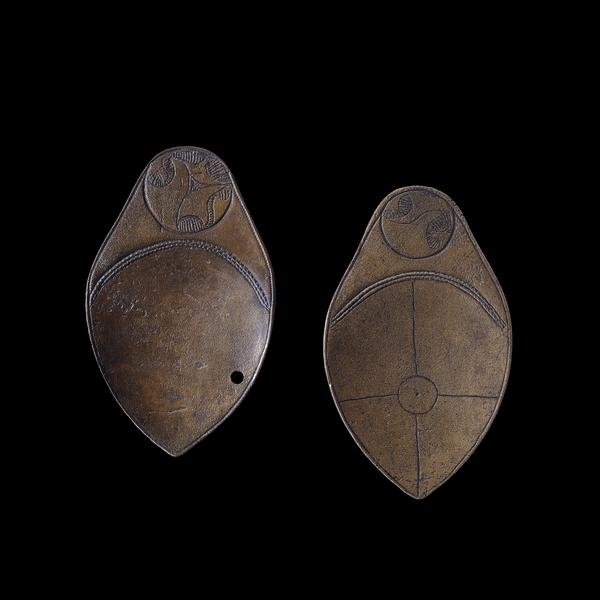 There aren’t many of these spoons about; these are two of just 25 found across Britain, Ireland and France. They’re almost invariably found in a pair like the Crosby Ravensworth ones and they all have the same basic ‘decoration’; one spoon is engraved with lines dividing it into four quarters, and the other has a hole drilled to one side. They have a shallow ‘handle’ at one end of each spoon, just big enough to grasp between your thumb and forefinger. As they’re not obviously well shaped for eating, there has been speculation since they were first found that they had a ‘ritual’ purpose. The earliest detailed account goes into great depth about a possible baptismal function2, but this theory hasn’t gained weight as the years have passed. 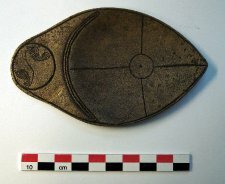 The British Museum3, which isn’t known for putting itself out on an arcane limb, suggests that they may have had a divinatory purpose, with liquid being dripped from the spoon with the hole onto the spoon with the quartered pattern, with meaning being drawn from which quarter the liquid landed. The British Museum suggests that water, beer, or blood might have been used. I suspect if our guesses about the method are correct, the liquid must have been quite viscous, so perhaps blood or even something like egg would have have worked best. Sadly, as with so many ancient things, this has to remain a tantalising theory4. Archaeologists learn from the ‘context’ in which items are found, and whilst we have a slightly better account for the Crosby Ravensworth spoons than we do for most Victorian discoveries, they just didn’t have the benefit of modern archaeological knowledge and practice. Those ashes, for example. Was it a cremation? Complete coincidence? Not actually ashes at all? They are intriguing, though. Like the Bewcastle cauldron and the Embleton Sword, they were found in boggy ground. None of the 25 spoons have been found, as far as we know, near settlements. Most are from bogs, rivers, or seemingly deliberately buried, and a few have been found in graves. Regulars at Esmeralda’s know how often I point out that our iron age ancestors had a habit of placing special objects – including, sometimes, people – into watery ground. Our ‘celtic’ ancestors – and indeed, people before then – believed in a celtic underworld that was home to gods and the dead. Watery ground was seen as neither ground nor air, but an in-between area where we might be able to get messages to the underworld, to ask for help or a blessing from deities and the dead. As often pointed out, the fact that we still insist in chucking coins into ‘wishing’ wells and springs suggests that this instinct runs deep. What, exactly, our ancestors wanted from their watery friends, we will never know. Bronze Relics of the Late Celtic Period, Albert Way, pp52-83. The Archaeological Journal, Vol. XXVI, 1869. Celtic Spoons by Very Rev. Canon Rock, p35. The Archaeological Journal, Vol. XXVI, 1869. And we should bear in mind what was said as soon as the year after they were discovered: ‘… it is, however, scarcely needful to insist on the necessity of great caution in the endeavour to associate with any hallowed use such mysterious relics of remote antiquity, to which no obvious or secular purpose can be safely ascribed.’ Albert Way, as above. This entry was posted in Folklore of Cumbria, Folklore: Magical, History of Cumbria, History: Iron Age, History: Unburied treasure and tagged crosby ravensworth spoons, cumbria history, divination, iron age cumbria. Bookmark the permalink. I loved this post Diane. Have a nasty feeling it was blood that dripped through that hole! I like the fact that although we can learn a great deal about the past, there are many things yet to be learned and many more that are likely to remain mysteries. Thanks for coming over, Patsy! Hi. I seemed to have missed this post initially. The spoons are stunning and their possibly use leaves a lot to the imagination. They are beautiful, aren’t they? And it’s fascinating that whilst they’re considered rare, there are quite a few of them extant and there was a period in history when lots of people knew what they were for – and yet we really haven’t the foggiest. The past is a mysterious and fascinating place.